A major X1 solar flare erupts from sunspot AR1875 on Oct. 28, 2013, GMT in this view from NASA's Solar Dynamics Observatory spacecraft. The sun has just unleashed another major solar flare, the third of its kind in three days, scientists say. The huge solar storm occurred late Sunday at 10:03 p.m. EDT (0203 Oct. 28 GMT). It registered as an X-class solar flare — the most powerful type of flare the sun has — and followed two back-to-back X-flares that erupted from the sun on Friday (Oct. 25). NASA's Solar Dynamics Observatory captured a video of the new X-class solar flare as it happened. Severe geomagnetic storms can cause disruptions in satellite communications and power grids, as well as pose a risk to astronauts in space, but the storm levels from this latest major flare should not be that extreme. "The magnitude of that storm is also still being assessed, but initial observations and modeling indicate severe storming is NOT expected," SWPC officials said. This latest X-flare registered as an X1.0 on the scale of solar storms used to track the sun's weather. It follows on the heels of an X2.7 flare and X1.7 flare that erupted from the active sunspot AR1882 on Friday. 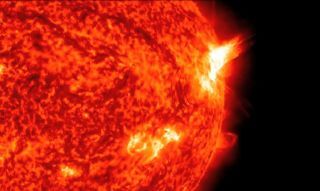 Astronomers rank the sun's solar flares into three main categories: C, M and X. C-class solar flares are relatively weak. M-class sun storms are more powerful, but still considerate to be mid-level events, and can super-charge the northern lights displays caused by Earth's auroras. When aimed at Earth, the most powerful X-class flares are ones that can interfere with satellite-based communications and navigation systems, and also endanger astronauts in orbit. The sun is currently in an active phase of its 11-year solar cycle and is expected to reach its peak activity level in the months ahead. Several intense M-class and C-class solar flares have erupted from the star over the last few days between the larger X-flares. "This is the 3rd X-flare since Oct. 25th, which means solar activity is still high," astronomer Tony Phillips of Spaceweather.com wrote in an update. NASA's Solar Dynamics Observatory is just one of a fleet of spacecraft monitoring the sun's current weather cycle, which is known as Solar Cycle 24 and began in 2008. Scientists tracking the cycle's activity, however, have said that despite several major flare events, this solar maximum period is the weakest of the last 100 years. Editor's note: If you snap an amazing aurora photo from the upcoming geomagnetic storms and you'd like to share it for a possible story or image gallery, please contact managing editor Tariq Malik at spacephotos@space.com.